Today’s post is to add a little “fire” to your summer backyard soirées. 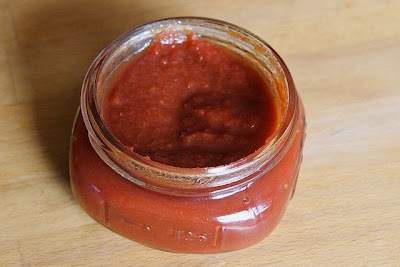 You can make this ketchup as smouldering as you want, or as mild. The kindling? Chipotle peppers. It’s always a little enlightening when something you thought you knew turns out to be all wrong. Such is true of the origins of ketchup. As with many condiments introduced during Victorian times I thought ketchup would be from India, where the English were inspired by so many other exotic ingredients and influences. Nope… Not only is it not Indian, it pre-dates the Victorian Age. In the 17th Century Dutch and British explorers discovered a salty pickled fish sauce called “ketsiap” in China, but it was more akin to today's fish sauce than what we think of as “ketchup.” When the sauce arrived in Europe via explorers and trade variations quickly followed using ingredients such as mushrooms, oysters, and walnuts. If you search for any of those with the term “ketchup” or “catsup” before them you’ll find recipes. I have yet to try any, though. don't use will keep for a long time. The first ketchup recipe was printed in 1727 in The Compleat Housewife. The recipe included anchovies, shallots, vinegar, white wine, cloves, ginger, mace, nutmeg, pepper and lemon peel. But no tomatoes. 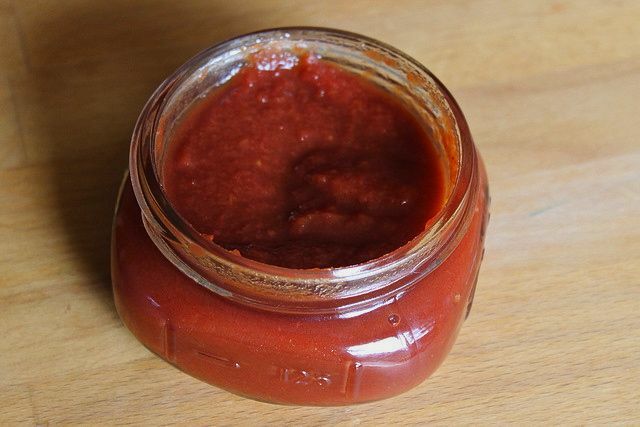 Around 1800, the first North American tomato ketchup recipe was published in – of all places – Nova Scotia, by James Mease. Recipes continued to change and be modified, most usually using mushrooms in Britain and tomatoes in North America. The marketing of ketchup quickly developed with many small producers selling their own variations on the tomato based recipe. The real popularity of the sauce came in 1872 when H.J. Heinz added ketchup to his manufacturing line and introduced it at the Philadelphia World’s Fair. Heinz Ketchup has not changed since, and is the gold standard against which all other ketchups are judged by most folks. I’m not sure when it became the preferred condiment for fried food and hamburgers, but it most certainly has. Ketchup actually does have health benefits from the tomatoes which contain lycopene, an antioxidant known to reduce cancer risk. 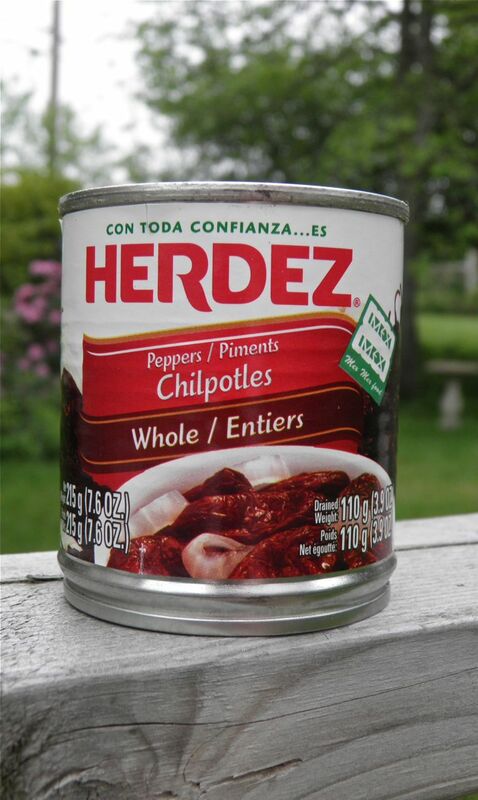 Chipotles are available canned in the Mexican section of the grocery store. In our province the usual brand is Herdez. You can increase or decrease the amount of heat in your finished product by the amount of seeds you leave in the peppers. I have found out through trial and error that half the seeds is about right. This is a fantastic ketchup to have on hand for the summer. It adds a smoky kick to anything you choose to use it in. It’s actually one of my favourite ketchups. I apologize for the lack of photos, but I have yet to make my ketchup for this year. Once I do I'll try to remember to add them. Rest assured, this recipe is "Docaitta tested" and has my seal of approval. Heat oil in a heavy saucepan or Dutch oven. Add the red peppers, onions, garlic and tomatoes. Allow to cook over medium heat until they are very soft. This will take from 5-10 minutes. Add the vinegar and sugar. Cook on medium low for 20-25 minutes. Allow to cool slightly and transfer to a blender or food processor. Process until smooth. Add the chopped (and seeded as you wish) chipotles. Purée again until smooth. Return to the pan and simmer on low for 30 minutes longer, stirring occasionally to ensure it doesn't stick to the bottom of the pan. While still hot, place in bottles or jars and then refrigerate.